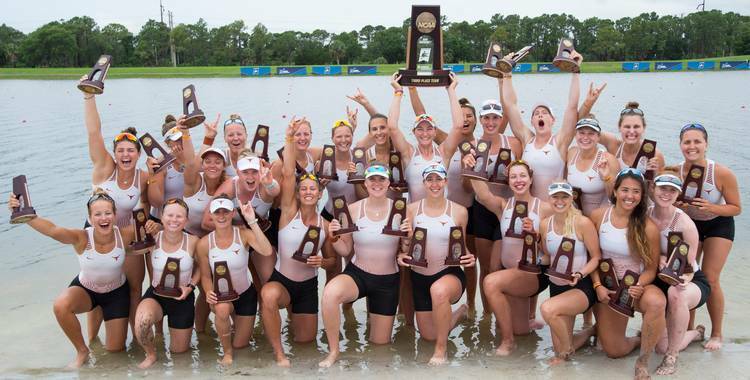 The Texas rowing crew made history Saturday by taking third place in the final team standings at the NCAA Championships in Sarasota, Fla.
Texas advanced all three of its boats to the grand finals for the first time ever. Each boat recorded a top-five finish. California claimed the overall team title with 130 points while Washington took second with 128 points. The Longhorns scored 115 to secure third. Officials altered the race schedule due to the threat of inclement weather. So the grand finals were contested Saturday instead of Sunday. The Longhorns’ I Eight boat took third in the grand final, a best for the Texas program. The Texas II Eight boat took fifth while the Four boat placed fourth.